The Roosevelt Island Tramway was born in 1976 as a means to shuttle residents to and from Manhattan. It was born due to resident frustration with the New York City Transit Authority, who had made unsuccessful plans to provide subway service from Roosevelt Island to Manhattan and Queens. Over twenty years later, the Tram has serviced over 20 million passengers and provided passengers with a breathtaking view of New York as they are quickly shuttled between Roosevelt Island and Manhattan. The Tramway was built by the Swiss company Vonroll under designers Prentice & Chan and Ohlhausen in 1976. 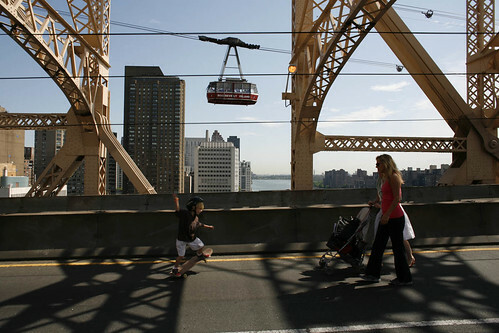 Holding 125 persons, the Roosevelt Island Tram is the only commuter cable car in North America. It travels a distance of 3,100 feet at an average speed of 16 mph in 4 1/2 minutes. It rises to a maximum height of 250 feet and travels at certain points parallel and slightly above the adjacent Queensboro Bridge, linking Long Island City, Queens, and 59th Street in Manhattan. Roosevelt Island Tram and the Bloomberg Tower. 3 April 2004. Roosevelt Island Tram, Queensborough Bridge and the Bloomberg Tower. 2 August 2003.